Join artist and Associate Curator of Art Doug Stapleton for an evening of art making and general creative mayhem. Using the art works from the STILLNESS & Gertrude Abercrombie exhibitions as inspiration, participants will create their own still life, landscape, interior, or portrait using found images cut and pasted from various sources. No drawing or painting experience needed! You will leave with a finished piece ready to tape to your refrigerator or hang on your wall! 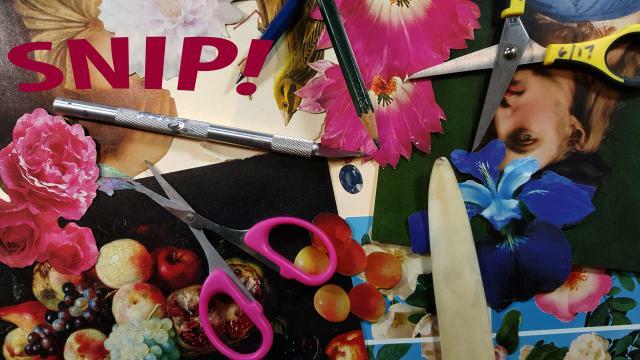 Stapleton will guide the process of making your collage with humorous anecdotes and small pearls of artistic wisdom. Beverages, including adult beverages will be served. Limited to 20 participants. Advance registration required by Monday, April 16. Register online at bit.ly/collageregistration or by mail with this form. Doug Stapleton is the Associate Curator of Art with the Illinois State Museum, an educator, and an artist. He has exhibited throughout Chicago, across the country, and in Paris, France. He is represented by Bert Green Fine Art in Chicago. Visit his website: dougstapleton.com.